The Gulliver casing is a signature of the Tendence brand. The refined design has resulted in a multi-dimensional sporty yet elegant watch, with sharp, sleek aesthetics, redefining modern watch design. Composed of 41mm stainless steel, high tech polycarbonate case and trademark silicon strap, the Tendence Gulliver Medium offers incredible strength, resistance and durability, plus functionality with high quality quartz miyota movement and 100 meter water resistance. 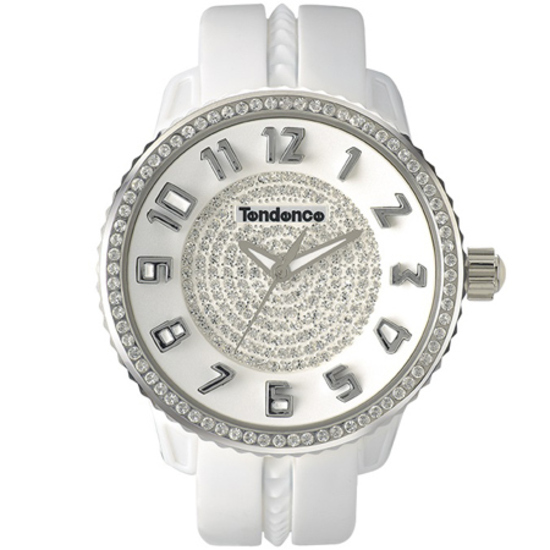 The dial and bezel is covered with a blanket of sparkly Swarovski crystals to add a touch of Glam to this signature watch.